Auto shut off system for safety. Auto shut off system for safety. On / Off Switch. Quick 2 minute Heat Up time. Curved 6 1/2″ brass pipe directs steam in a tight pattern. Jiffy metal steam heads are aluminum with a wooden handle for durability. The Norel plastic steam heads and handles are cooler to the touch than metal and wood. All brass couplings. 1300 Watt heating element. 50/60 Hertz electrical system. Cleans surfaces with the power of steam. Made in the USA. 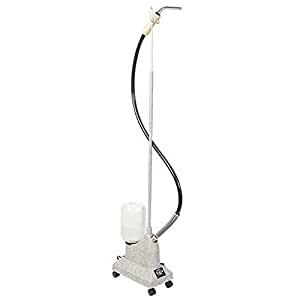 The Jiffy Steamer Model J-2W is a speciality steamer used worldwide in beauty salons, hair replacement establishments, rental outlets, supply houses, and window film installation companies. This unit can be useful in a variety of settings and applications, including: Styling Wigs. Gentle on natural and artificial hair. May be used with rollers to achieve and set long lasting styles. Easily removes old window film.